It seems that cemeteries on Halloween are a running theme with me. 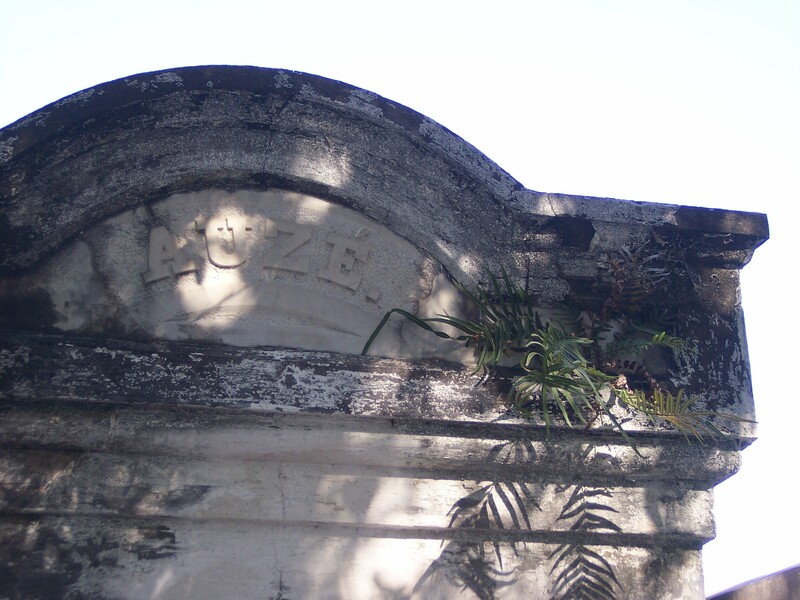 The Lafayette Cemetery is famous. Play the music as you read. 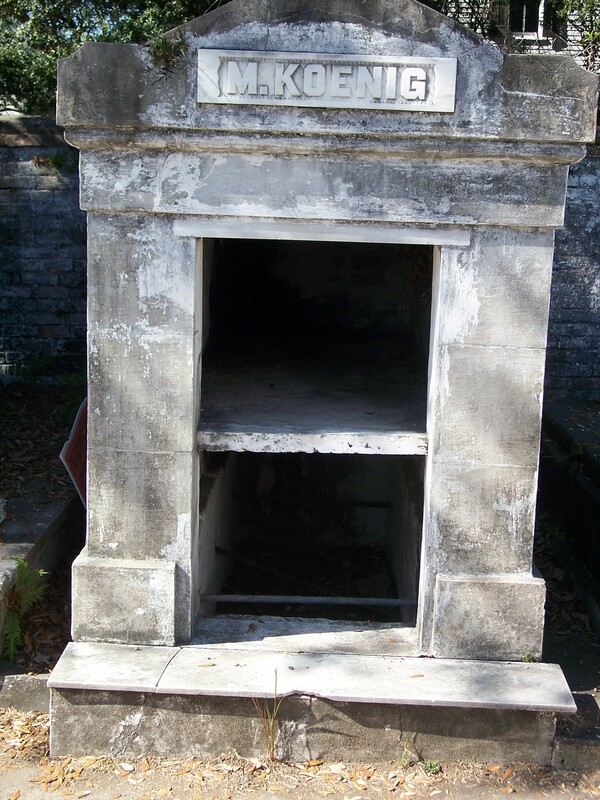 Lafayette Cemetery is an above ground cemetery built in 1833 and it was the second Protestant cemetery in New Orleans. You know how dangerous Protestants are! Sorry, bad joke. 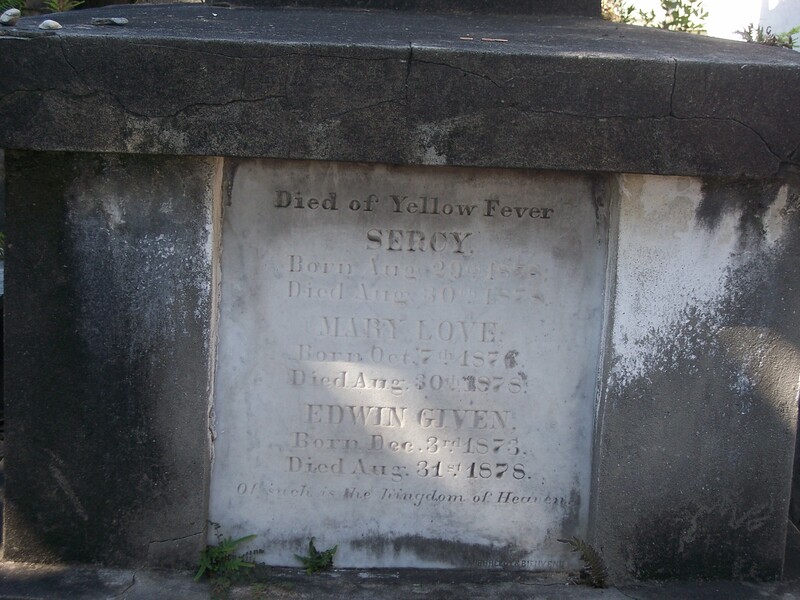 Yellow Fever almost filled it up by 1840. The tombs are usually used by entire families for generations. Each person interred has their name carved into the stonework. These above ground cemeteries have been called Cities of the Dead. And with good reason. It’s laid out in neat rows. It feels like a miniature city as you navigate the avenues. A rather creepy city. The dead are buried above ground because New Orleans is a bowl. It floods. Crypts keep the dead contained and not floating down the street. 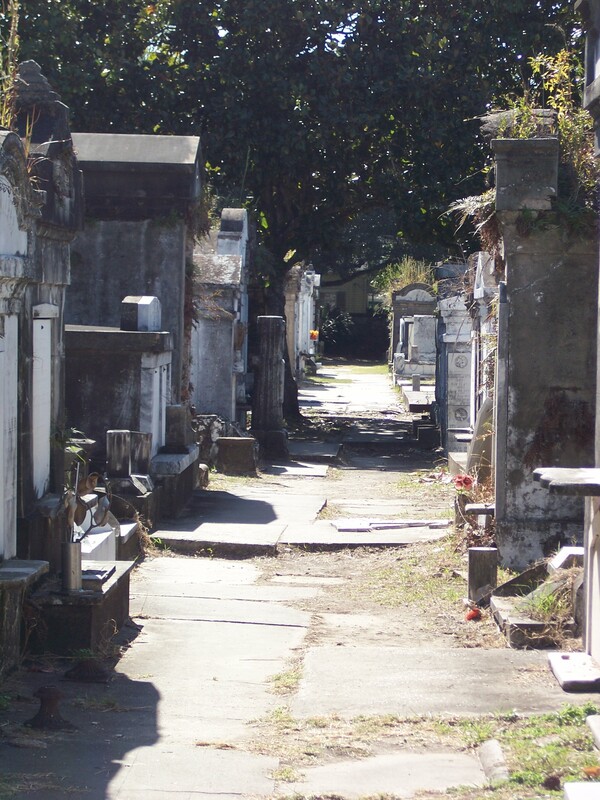 New Orleans is famous for it’s cemeteries and funerals. Honestly, who wouldn’t want a jazz band and second line at their funeral? I want one. The Lafayette Cemetery is famous. 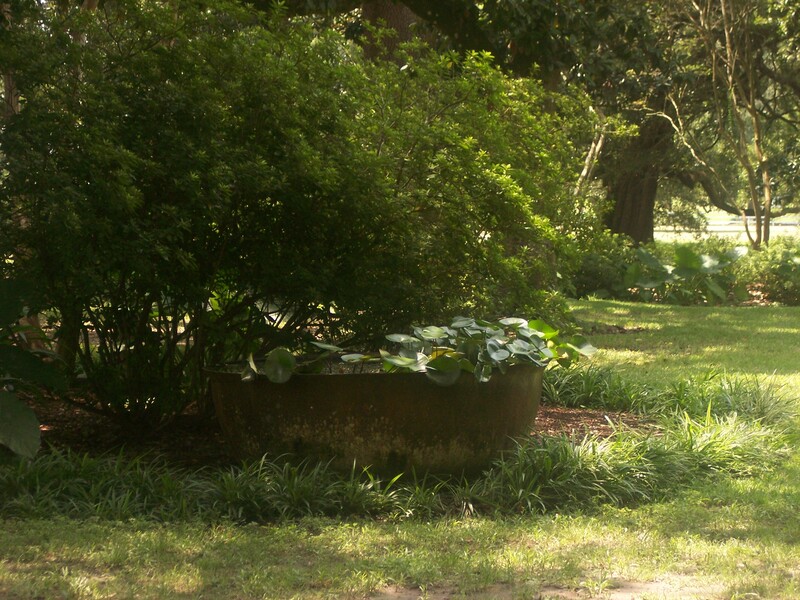 Anne Rice used the cemetery for the backdrop of several scenes from Interview with the Vampire. She also held a fake funeral to promote her book, Memnoch the Devil. ched that show is because it shows New Orleans, and I love New Orleans. I don’t know what happened to the resident of this tomb. Any ideas? Hope you all have a great Halloween. Don’t stay out too late, NaNoWriMo starts in the morning! Don’t eat too much candy. Do you have a favorite cemetery? We have finally made it to the French Quarter. Yippee! This post doesn’t have as many photos. We arrived late in the day and we were exhausted. I’ve been going to the French Quarter for 40 years. I didn’t take as many photos, because it looks the same. Always beautiful, always fun. There’s a flavor to this city that is found no where else. When she appears in books, the city becomes a character not just a city. I love NoLa, but it is a dangerous city. Watch where you go and your surroundings. Ladies watch those drinks! The city is know for the endless party atmosphere. But it is also extremely hot in the summer, drink a lot of water. By accident, we arrived in the Quarter as people were arriving for a Saints game. The Quarter was empty! I loved it, we had the place to ourselves. Of course that late in the day, most of the shops are closed. The bars and restaurants were still open. There are many hidden courtyards and parks. Some of these are private so look before you enter. NoLa has great shops. From odd to antique. Not all are appropriate for young children. Trust me there are things you don’t want to explain to a 7 year old. When you travel with children, walk in and look around before you let the kids inside. 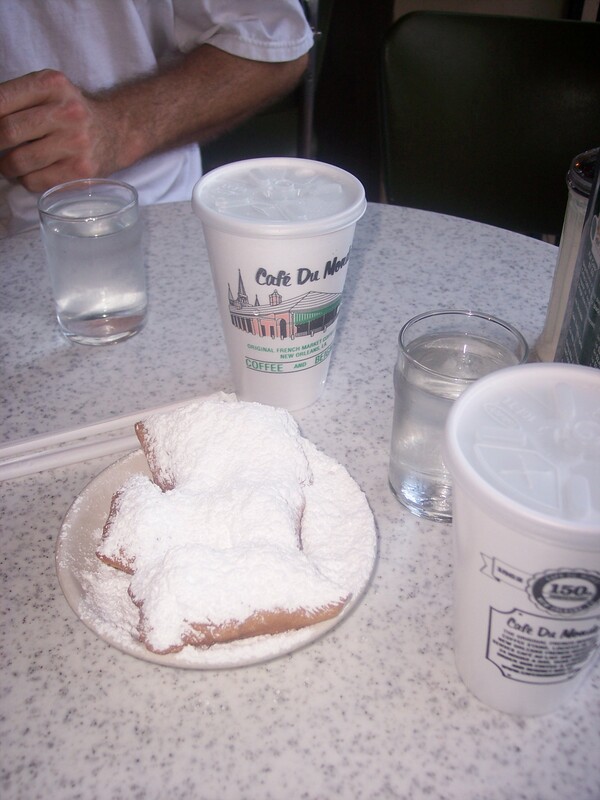 Do not leave without going to the Cafe Du Monde and eating a plate of Beignets. Yes, it’s totally a tourist thing to do. But the locals eat there and they are awesome. The Cafe has been open since 1862. There is a small inside eating area, but most eat in the covered patio with the pigeons. Beignets are french doughnuts covered in powdered sugar. Just don’t exhale as you eat. 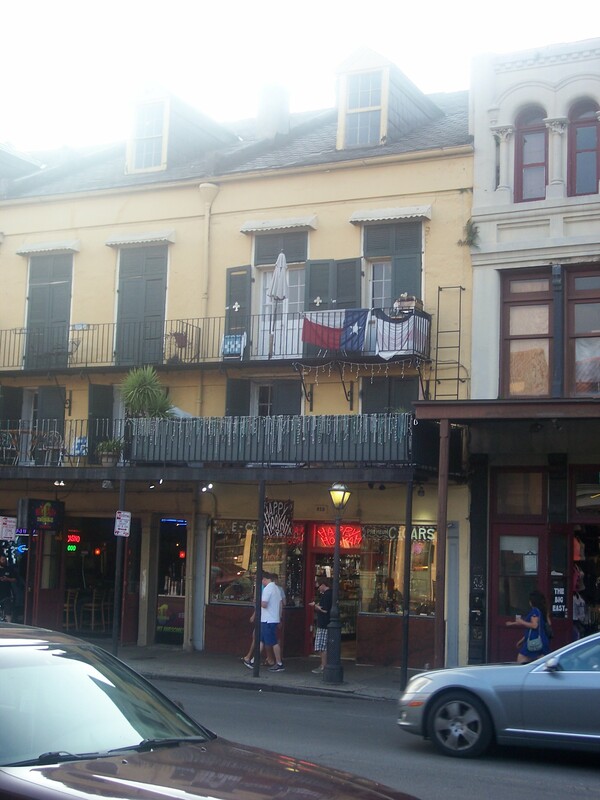 also called, Vieux Carré and the Quarter. 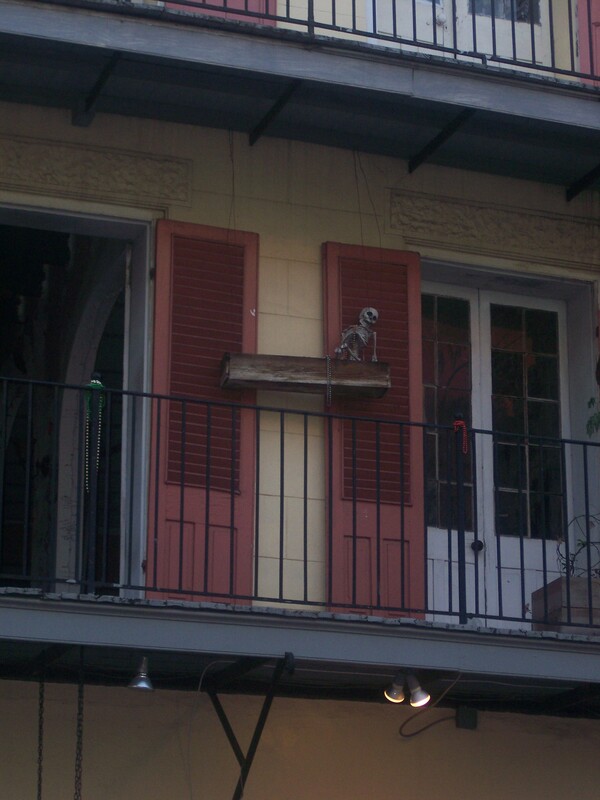 It sits in the curb of the Mississippi River and is NoLa’s oldest neighborhood. Interesting side note, the Quarter marks the highest ground in the city. Architecture is a mix of French, Spanish, Creole, and American. It is most famous for the iron lace balconies. 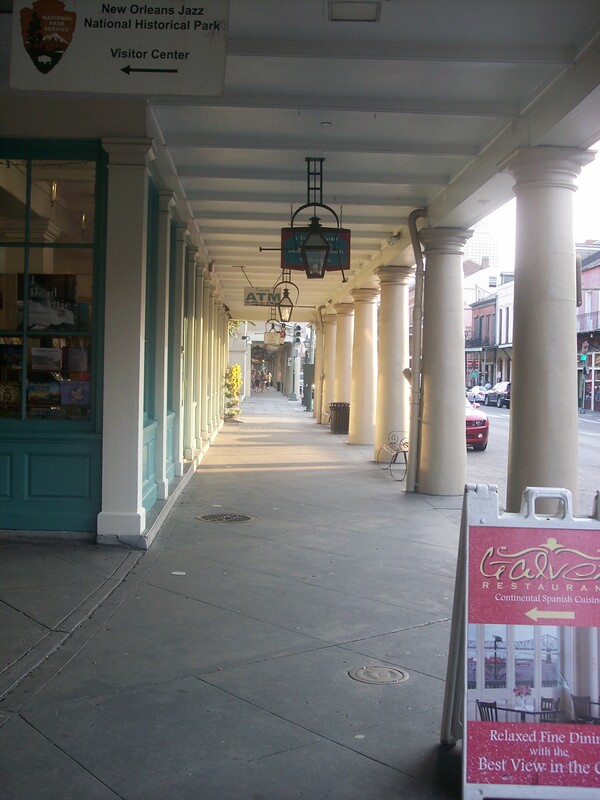 The French Market is a large are in the quarter, near the Cafe, that has many shops and restaurants. This picture shows how empty the Quarter was that night. I will leave you with one more picture of me and a new friend. 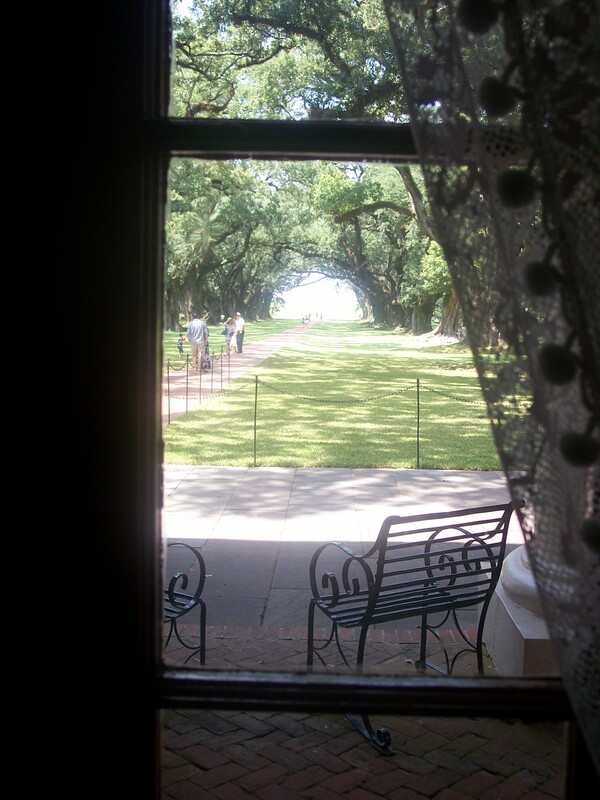 Oak Alley was a sugarcane plantation. It is known for it’s 1/4 mile alley of 300year old oak trees. The house was built in the 1830’s. Yes, the house is much younger than the oaks! The Mississippi was visible from the second floor, until the most recent update of the levee in front of the house. 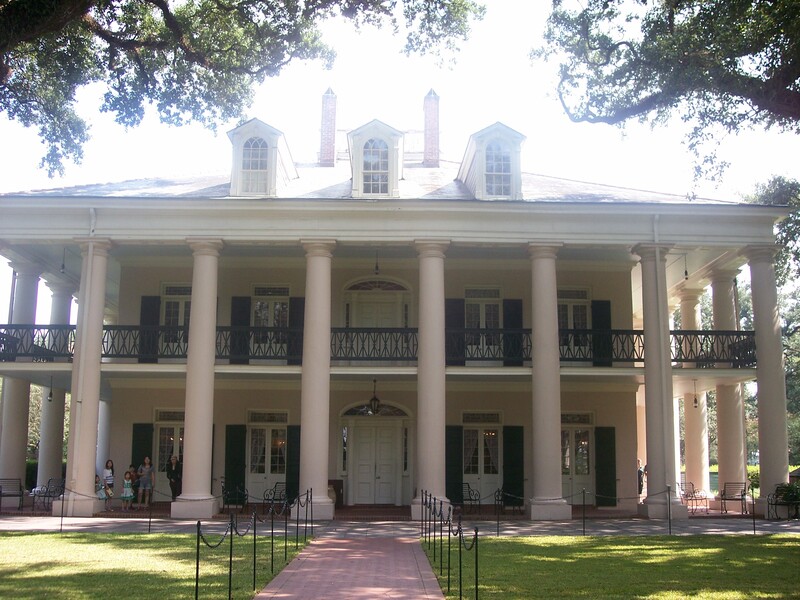 There were at one point, 50+ slaves at Oak Alley. Don’t quote me on that number. 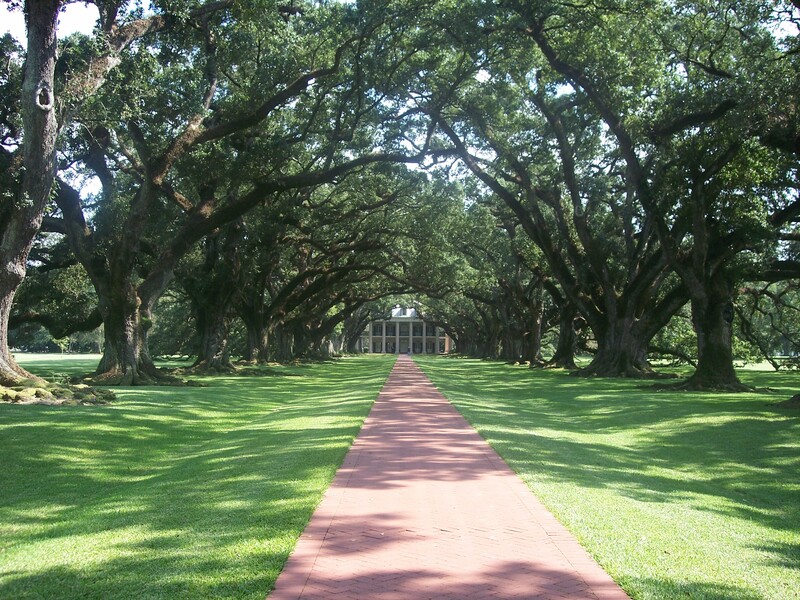 Oak Alley has been under the ownership of two families, the Romans and the Stewarts. Now, it is taken care of by a non-profit. Now, let’s get a look at this antebellum beauty. Oak Alley Plantation with 300 year old oaks. Looking at those photos, one would think the house is huge. It’s not. At least not by today’s standards. There’s maybe 4-6 rooms on each of the two floors. Those rooms are not that big. The inside of the house is divided by a large staircase. The porch is wide and wraps around the entire house. Those beautiful windows are actually doors. In the summer, they would be opened to allow the breeze to cool the house. The larger rooms have between 4 and 6 doors. A few photos of the inside. Sorry, no flash was aloud. The views surrounding the house are amazing. View from the first floor. View from the top floor. The mound of grass at the end is the levee. 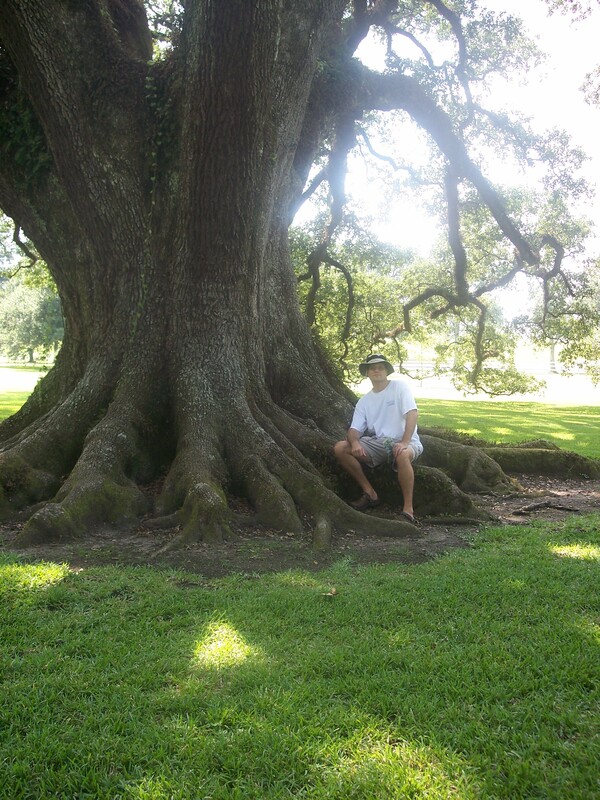 As I mentioned, Oak Alley was a sugar plantation. There are still acres of sugarcane surrounding the house. Dotting the yard are these huge cast iron bowls, called Sugar Kettles. These kettles were used in turning sugarcane into molasses and/or crystallized sugar. I’m not going to go into how they were used, but here is a place with great explanations and photos. 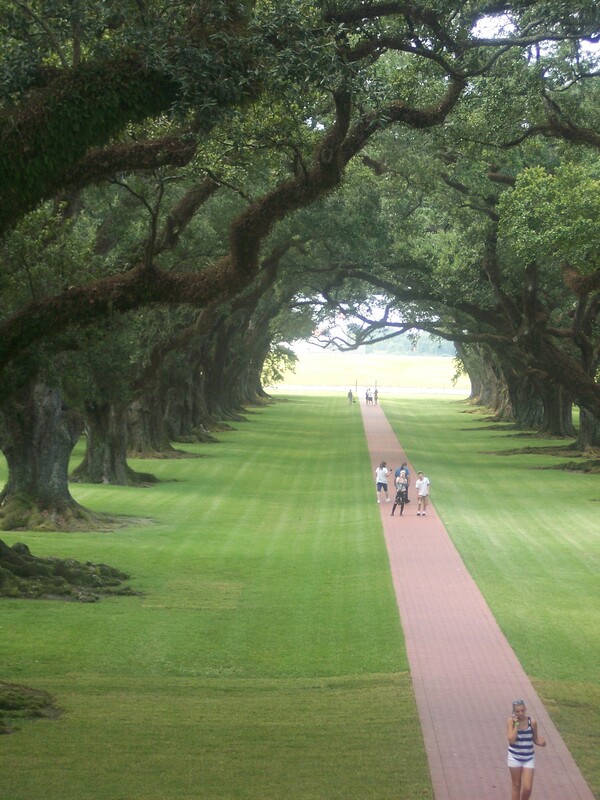 Oak Alley was a plantation, so there were slaves. The slave quarters on site are reconstructions, based on records. 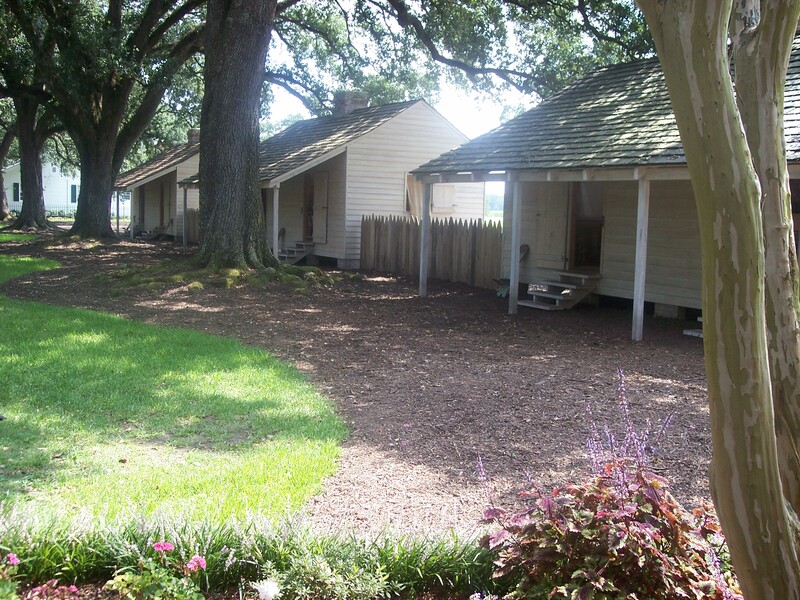 Unlike most slave quarters they were very close to the Big House. In 1836, there were 56 slaves onsite. There are 6 houses that represent slave quarters. Slave quarters were based on the slaves status. The more important (valuable) the slave the better the housing. Field hands were considered the lowest class of slave. They were given the worst accommodations and worked the hardest. Not sure how accurate these houses are. There is a list of names, carved into one house, of the slaves known to have worked at Oak Alley. There is a display of shackles and equipment used by the slaves. Inside slave quarters. These are a little nicer than I expected. 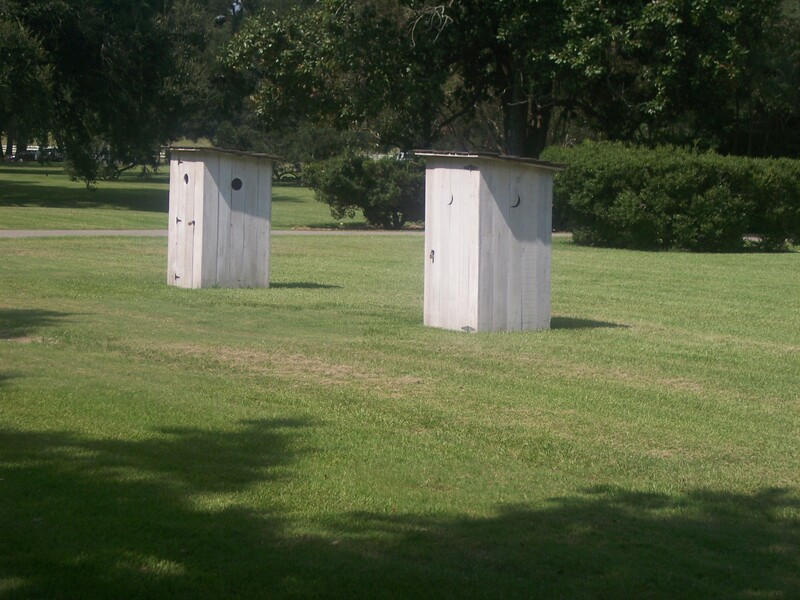 And no visit to the 1830s is complete without an outhouse! A few last minute thoughts. Oak Alley has never flooded. The area is higher above sea level than it’s neighbor New Orleans. Even though the Mississippi River is literally, just in front of the house, it does not flood. We actually saw the top of a ship go by as we walked by the oak trees. We couldn’t see the ship, just the top. I was pleased to see some sort of area dedicated to the slaves and their live on the plantation. Even if it was mainly just their names on a wall. No display can accurately describe what it was like to be a slave. The plantation is intake with the sugarcane fields and the lands around it. It is beautiful. It’s also a bed and breakfast. There is a pub on site that sells moonshine shots…just sayin’. I really enjoyed the plantation, and I learned a lot. Editing: I hope to sneak a little in today. Submissions: I am working on releasing a short story on Wattpad. The problem is I don’t have a cover. It’s a free short story, so the cover may be the title and not much else. Still thinking on that. I did not get a Kindle for my anniversary as I had hoped. I got something better. 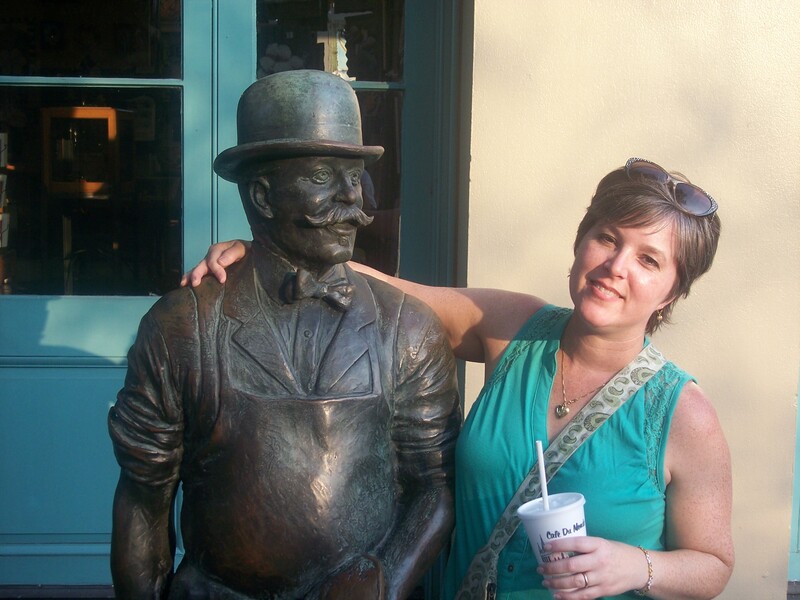 My honey surprised me with an all day excursion to New Orleans. Just the two of us, it was like we were dating. I’ll leave the sappy stuff out. We had a great time. I thought I would share a little of our trip. 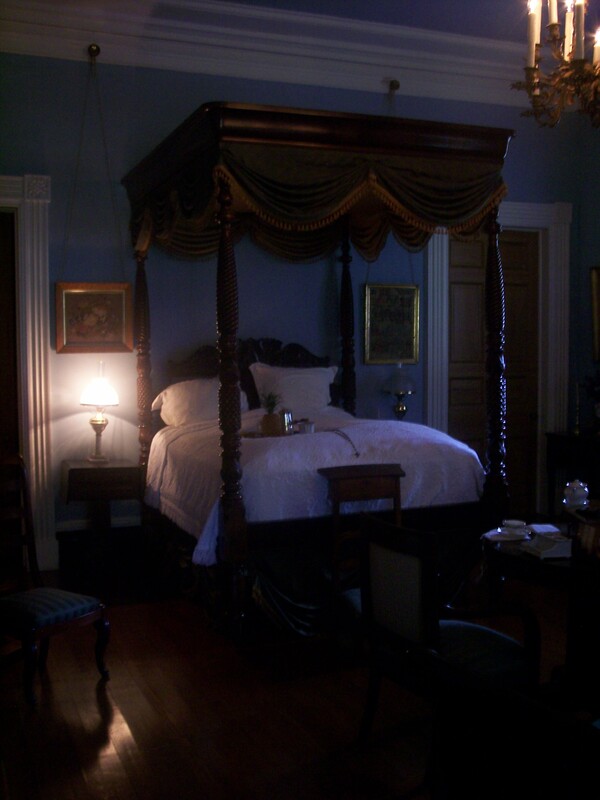 Some of you may be interested in writing about swamps, plantations, or the French Quarter. 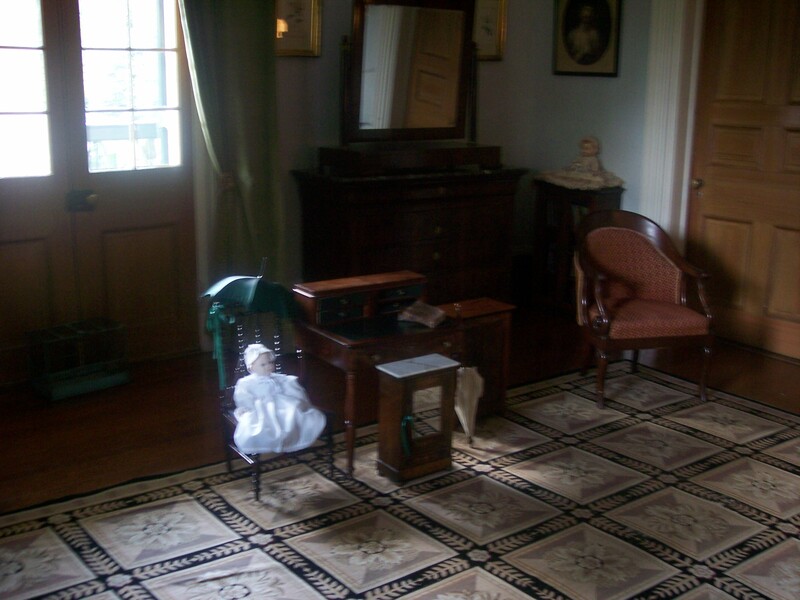 I have a ghost story I’m working on set on a plantation near a swamp so I had fun with a little research on our trip. This post will deal with swamps and the geography surrounding New Orleans. I still can’t figure how people decided to settle here to begin with. A sugarcane plantation on the Mississippi River. I live 2 hours from New Orleans, it is one of my favorite places to go. As a kid we would take day trips in the summer. There is an unbelievable amount of things to do there, not counting the Quarter. Tip: Summer in southern Louisiana is hot. I spent the entire trip with a light coating of sweat covering every inch of my body. I would go inside and cool off a little, the sweat would dry and leave my skin sticky. Take sunscreen, a hat, sunglasses, light weight clothing, and good walking shoes. Water is also a must. You will dehydrate quickly in the heat. The geography. 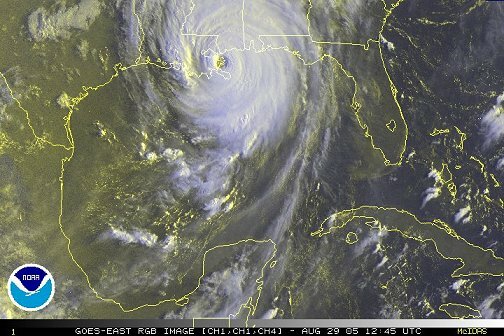 New Orleans is surrounded by water and parts of it are 5 feet below sea level. There’s a reason it floods. Here’s a map. Lake Pontchartrain is to the north, the Mississippi River runs through it, and wetlands are everywhere else. 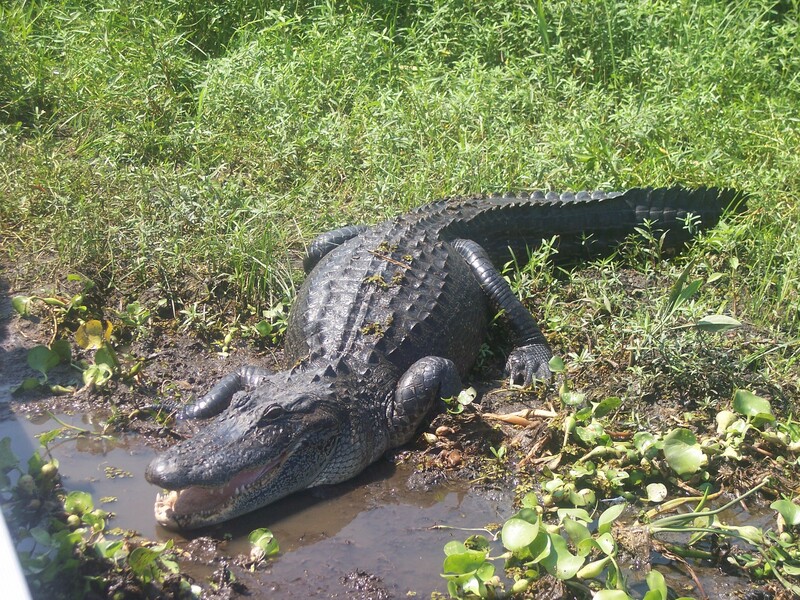 My WIP, Dead in the Water, has an alligator that mauls a shooting victim. 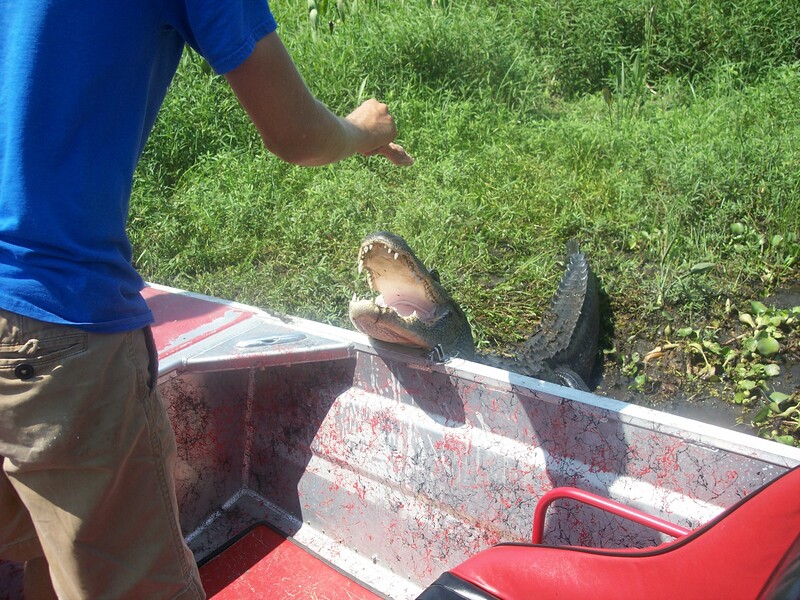 I thought it would be great to take a swamp tour. 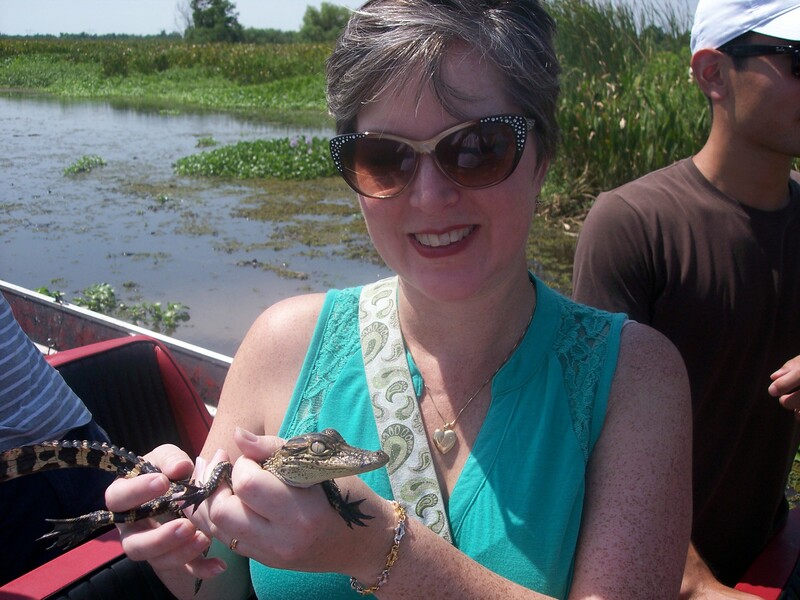 We went with Jean Lafitite Swamp Tours. It was amazing. We took the air boat tour. If you don’t know the difference between a swamp and a bayou, check my post called Lay of the Land. We have swamps in lower Alabama, but I haven’t been to any of them. I grew up in the bayou. This tour was in a swamp. The swamp is not very deep in most areas, we’re talking 4 inches of water. But if you try to stand, you’ll sink down because of the mud. Other areas can be very deep. The coolest thing about the vegetation of swamps is it has the appearance of a solid surface. It looks like you can actually walk across it. Until the wake of the boat sends small waves across and the vegetation moves with the water. It looks like carpet after a flood. Then of course there are areas that are firm enough to walk on. I did not take this tour just to look at the scenery. I wanted to see gators in the wild. Most of the gators around here hide. You catch glimpses of them as they sink or swim away. Sometimes you hear the dog bark in warning before they are eaten, but for the most part they hide. Not here. Now, in all honesty, I will say these guys are wild, but trained. Trained in that they know when they hear the air boat, they will be fed snacks. So they literally crawl, or swim, from everywhere. That does not mean they are pets. One guide was bitten yesterday when he was distracted by a tourist. Alligators are huge. Don’t let their size mislead you. They are very fast. Usually, when you see them they are sunning or slowly gliding through the water. These massive animals can hurl themselves a foot and a half out of the water. There jaws snap quickly as well. We saw that first hand as our guide tossed marshmallows and pig tails at the gators. Gator being feed pig tail. If you go to the zoo you don’t get a close up view of a gator. They have reptilian eyes (with 3 eyelids), extremely sharp claws on webbed feet, and very long, powerful tails. Their skin is more like plated leather. I know this is photo heavy, but you don’t normally, get this close to the swamp. I have one last photo to share. This made the boat ride worth it. I wanted to take this little guy home. I have to admit, I did not expect him to be so soft. The belly and side are almost like suede. The top of his skin is bump but smooth. Odd I know. It was a great trip, very educationally. I hope you can find this useful.